After living on a farm for decades, this retiree was ready to move into town to be closer to her children and grandchildren. 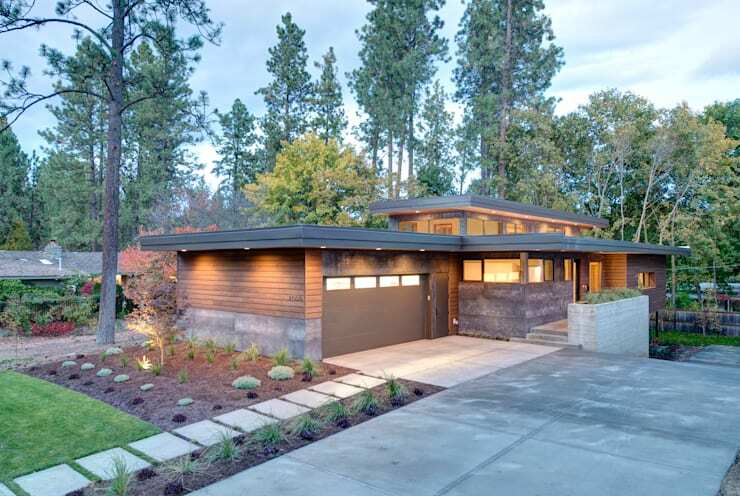 Located on a Spokane, WA property surrounded by mature trees, the main functional rooms of this modern wooden home are located on the ground floor, designed for convenience as the retiree ages into the home. Being built on a small slope, the basement of the home receives plenty of sunlight and houses the guest rooms as well as a recreation room for the grandkids. This home, built by architects from Uptic Studios, is an excellent example of an architecturally stunning home that's been carefully conceived and customized in order to conform to the particular lifestyle of its inhabitants. 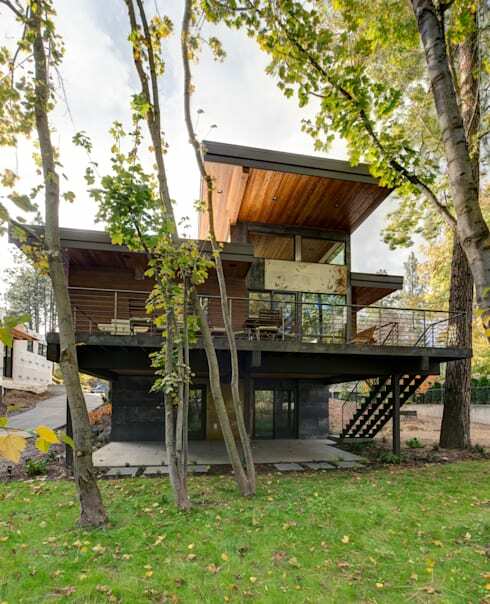 A first glance at this home draws an instant visual connection to images of a childhood tree fort, with its blocky rectilinear forms, elevated appearance, and plentiful shelter from the surrounding trees. The section of the home overlooking the backyard benefits from an expansive patio with fine metallic railing that allows for open view of the sloping grassy lawn. Beneath the balcony, the grandchildren's playroom enjoys a sheltered outdoor area for playing outside on rainy West Coast afternoons. Although this home has been design to grow old in, the style of this home is anything but tired. 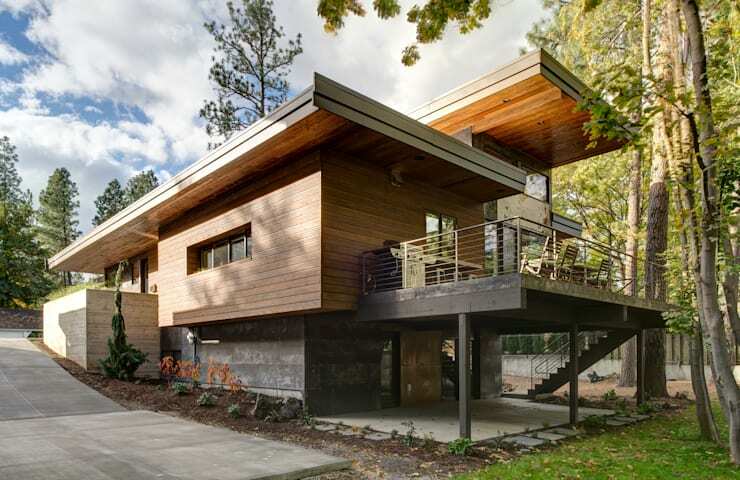 Modern aesthetics has strongly influenced the exterior of the home, which offers up a mixture of wooden planks, polished metal, and textured wooden panels. Combine this modern material mixture with a terraced flat-roof design, and this home is prime example of modern design. From the street, you can appreciate the home's convenient design, with a wide street-level driveway leading into an attached garage, with just a few steps rising towards the main mass of the home. It's this main, street-level floor that houses the functional rooms of the home; this one-level arrangement is ideal for an older inhabitant who wants to stay mobile as they age. 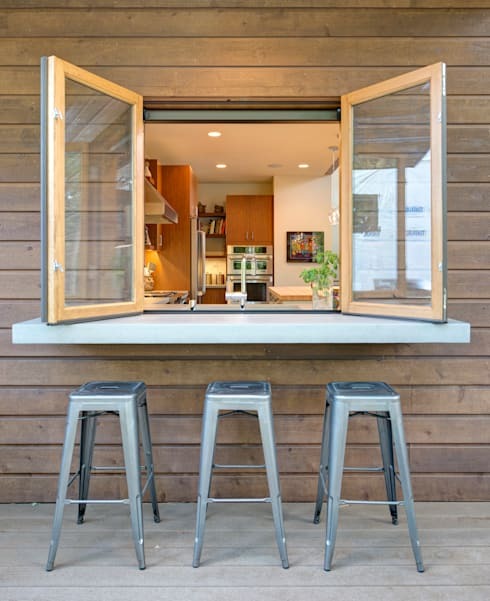 This unique patio design features a window that connects a patio bar with the kitchen, a perfect arrangement for a grandmother who wants to host family gatherings at her home. 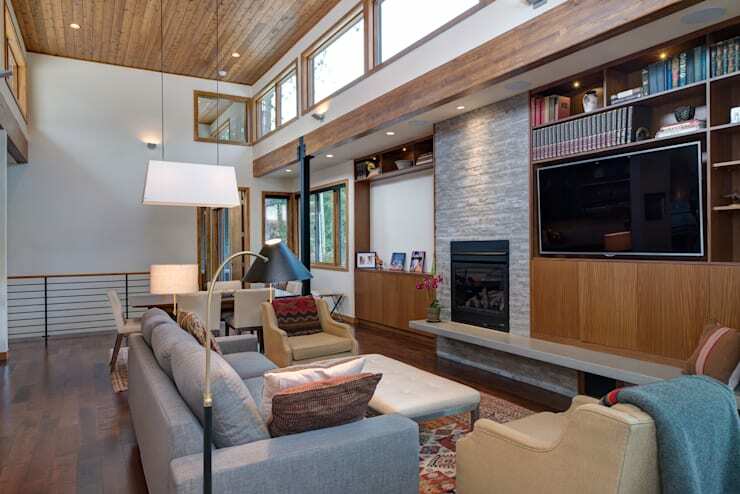 The home's blocky rectangular design houses a lofty living room in the central mass of the home. The extra feet of wall extended at the top of the room have been opened up with windows, flooding the living room and dining room with natural light. A fireplace occupies the center of the main wall, with an assortment of mid-toned furniture gathered around for a friendly evening with family. 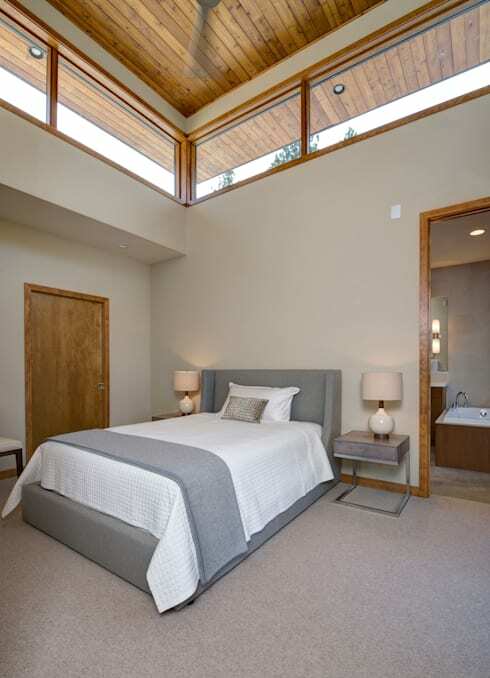 Also on the main floor, this master bedroom enjoys an equally spacious atmosphere with natural light bridging the gap between walls and ceiling. All over, neutral tones and soft textures make this bedroom into a comforting, and an intentional symmetry in the decor brings about a sense of balance and relaxation. It appears as though the farmhouse has followed this retiree straight into her new home. Subtle mentions of country living abound throughout the space, from the chicken-themed decor to the wooden countertop to the glass lanterns hanging overhead. 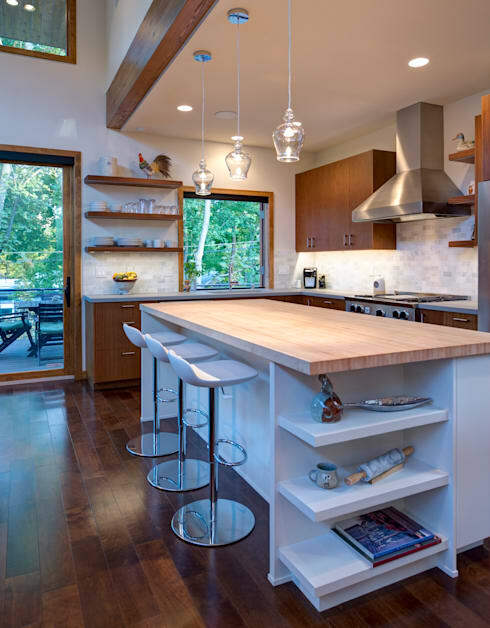 Meanwhile, the kitchen receives a dose of modernity with sleek white stools and stainless steel appliances in a unique blend of old and new. The breakfast bar in this kitchen is a perfect example of the practical design that makes this home so friendly – if you're looking for more ideas for your own kitchen island or breakfast bar, you can find 10 unique models in this ideabook! Free from the hassle of stepping over the tub, this bathroom houses a convenient standing shower at the end of a row of bathroom fixtures. 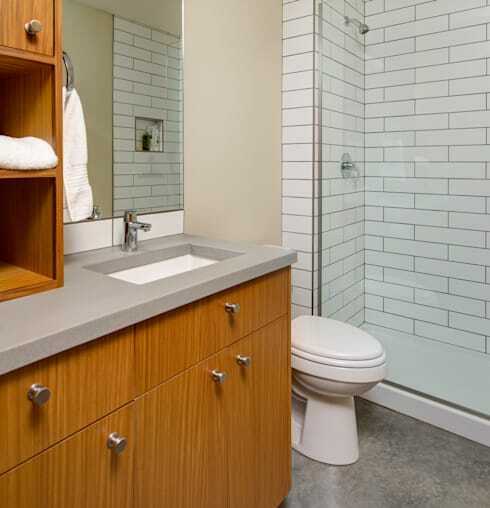 This linear arrangement creates a simple, streamlined bathroom where easy storage and mobility are major factors in the room's design. What do you think of this practical modern home? Comment below!